I am a major online shopper. Big time. I don’t just go to the internet, randomly pick something, and purchase it. No. I get an idea of what I want. I do some research. I read reviews. I put my top 3-5 contenders in a wish list. Then I wait. I wait for a while. Then after I feel like I have thought long enough, I decide and buy. Sometimes I think about it for well over a year. That’s why I like to shop online. It allows me to over-analyze the purchase. Plus it helps that the things get delivered right to my door!!! And these bicycles were no different. We spent our years heading to Walmart and grabbing a bike and crossing our fingers. Didn’t usually end well (did it ever end well???…). I changed and went to online shopping. The whole over-analyzing thing. These are bikes that have stood the test of time. These are bikes that can be passed down among the children because they will last that long. This post contains affiliate links. We have owned this bike two times; we owned it once for Brayden in boy version and we now have one for McKenna in girl version. We have never had any issues between the two bicycles and I would totally buy this again. This is a great style for a child who likes to ride hard. This bike retails for 125-ish. Don’t pay more! I have seen it listed for far more than that. Right now, it is on sale for $99.99. This is Kaitlyn’s current bike and she completely loves it. She finds it comfortable and of course being stylish matters to her. 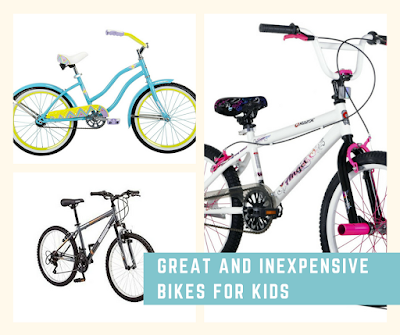 Since it is a cruiser, it is of course great for the child who likes to be relaxed in riding. Again, no issues with this bike and we would totally get it again. This is currently on sale for $93.49. This is Brayden’s current bike. It has been a great bike and we haven’t had any problems with it. I would get it again and the price is great! There you have our current bikes. We have had them all for over a year. They have lasted through the weather and the treatment of children. One of them (the first) is one we have had for many years (we still have Brayden’s version) and it is in fantastic shape. The seats are all still in one piece and the bikes look good (one bike we got from Walmart had its seat in pieces by the end of the summer…). So I am all around happy with these!